These Low Carb Crepes are flourless crepes that can be made either sweet or savory. Either way, you’ll love them! Traditionally, crepes aren’t exactly low carb. 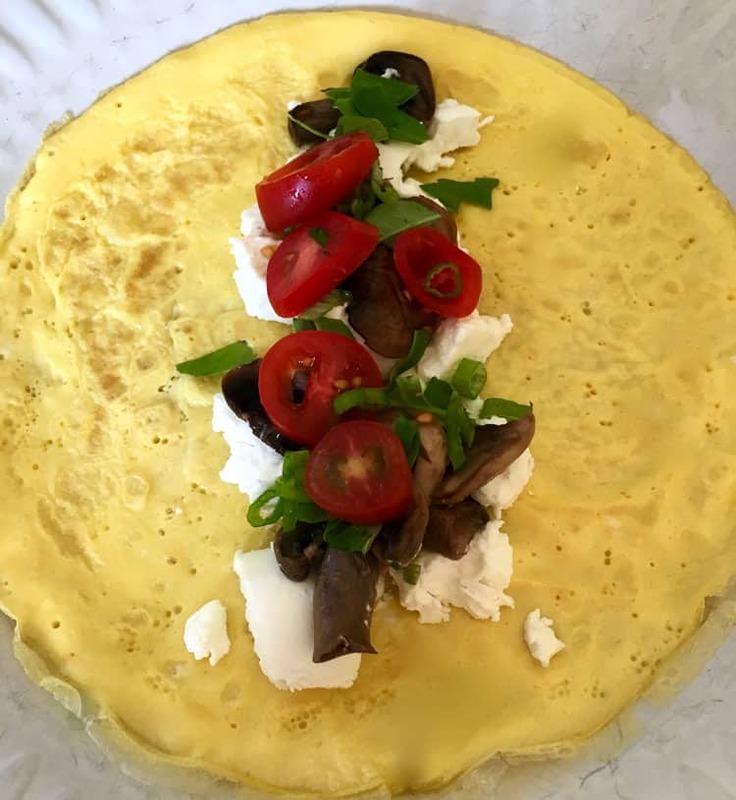 The popular French dish is commonly made by combining a few low carb ingredients (eggs, milk, and butter) with a few high carb ingredients (flour and sugar). The result is a tasty breakfast treat, but if you’re trying to keep your carbs down, traditional crepes are an easy way to blow your diet. Thankfully, eating fewer carbs doesn’t mean you have to give up crepes forever. I’m going to show you how to make low carb crepes that are just as good as the real thing! That’s definitely the ingredient list for low carb crepes and gluten free crepes… no carbs or gluten hiding anywhere! 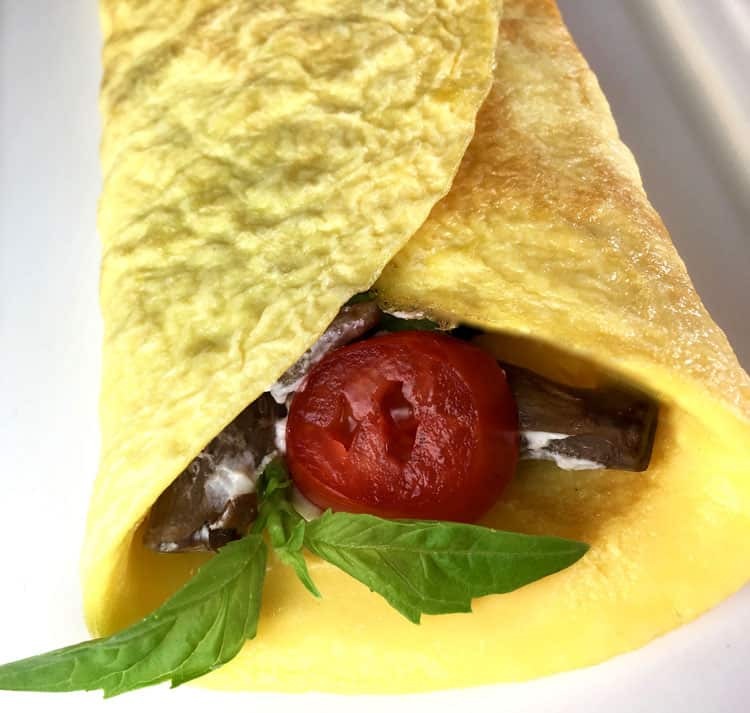 Depending on what kind of mood you’re in when you wake up (or during lunch or dinner… no judgment here – crepes are great any time of the day), you can make these crepes savory or sweet. Let’s talk about the fillings and how they fit into low carb diets and gluten free diets. If you’re following a gluten free diet, you can fill them with my suggested savory or sweet fillings with no modifications. They’re gluten free as listed. If you’re following a low carb diet, you’re good to go with my suggested savory fillings (goat cheese, grape tomatoes, white mushrooms, basil, and green onion). 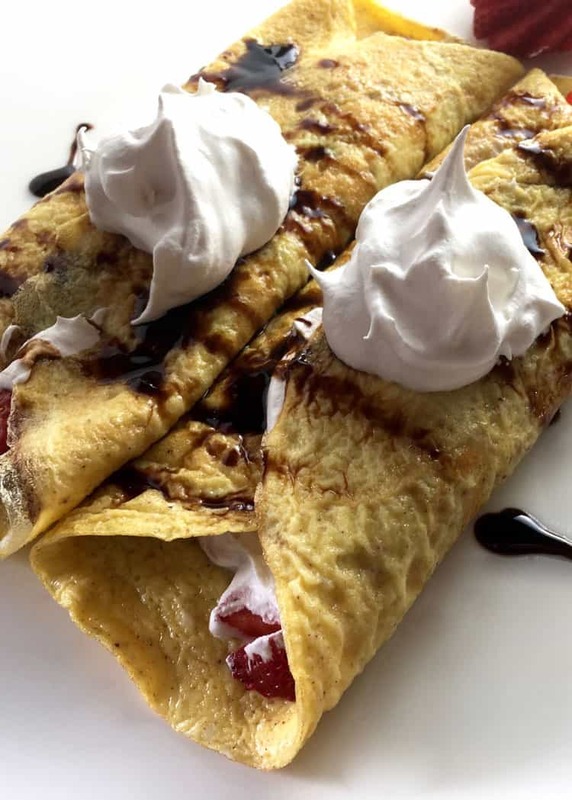 No matter your diet, there are plenty of ways to make these Low Carb Crepes taste amazing! When cooking savory crepes, you can add black pepper, salt, garlic salt, and/or dried herbs to the crepe batter before you cook it. 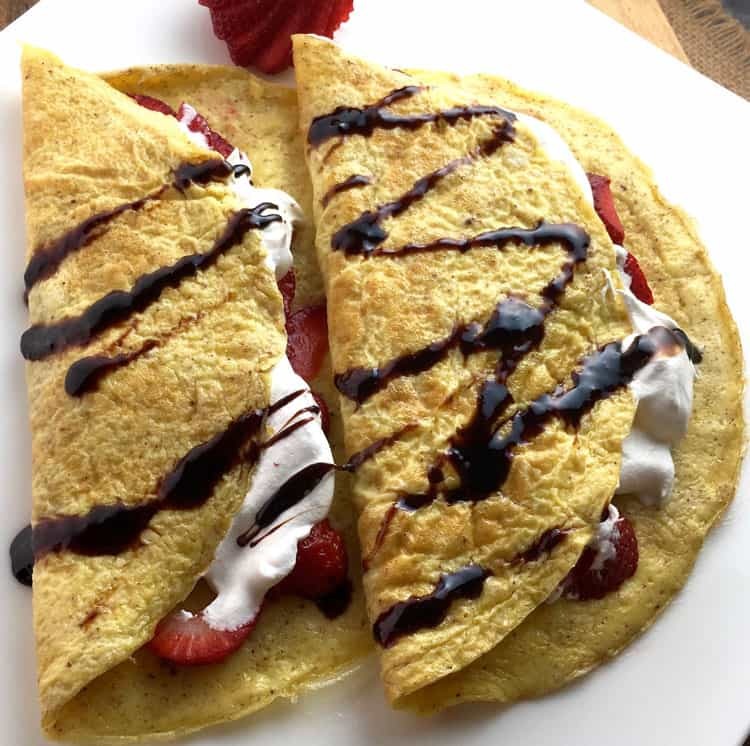 When cooking sweet crepes, you can add cinnamon, vanilla extract, and/or a sugar substitute to the crepe batter before you cook it. You’ve definitely found your next favorite breakfast with these low carb, gluten free crepes! In a large bowl, combine eggs, half and half, and olive oil. Whisk until smooth. Optionally season batter with spices, extracts, sweetener, etc. On medium-low heat, place a 10" non-stick skillet that has been lightly sprayed with non-stick cooking spray. (Adjust heat to slightly above or below medium if necessary.) Pour 1/4 cup of the egg batter into your pre-heated skillet and swirl the pan evenly until you've coated the bottom with a thin layer of crepe batter. (Add more batter to fill if any holes appear.) Cover the pan and cook the crepe batter until it begins to set, which will take 2-3 minutes. Don't overcook it! After the batter is set, use a silicon spatula to (gently) loosen the edges and flip your crepe. Be careful and make sure you don't break or tear the crepe. Cook for an additional minute and then remove the crepe. Repeat the process with the remaining batter. Fill each crepe with your desired filling (keep the filling in the middle of the crepe) and fold over both sides to cover the filling. Serve immediately. To Make Whipped Cream (Maple or Plain): Pour 1 pint of heavy whipping cream into a large glass bowl. Using a hand or immersion blender, blend the whipping cream until it changes texture and is twice the size. If you just want low carb, plain whipping cream, stop at this step. To make maple whipped cream, drizzle 1 to 2 tablespoons of maple syrup into the bowl and continue to blend until the whipped cream is light and fluffy. To Make the Balsamic Glaze: Over medium-high heat, heat one cup of high-quality balsamic vinegar until the vinegar begins to boil. Reduce the heat. Simmer and stir continually until the balsamic vinegar is about 1/3 of the original volume. Once the vinegar has reached a thick, syrupy consistency, it's ready to use. Cool slightly before serving.